without the encouragement of like-minded people. By joining the group members will learn from both each other and industry experts, they will avoid repeating mistakes, fast tracking their personal and business success. We are forming Regional Groups in England and Wales. 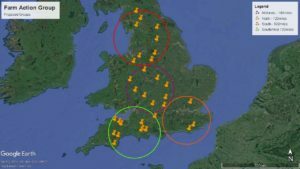 Maps show the current members, welcome new people who are interested in joining, especially in South England and Wales. Actively farming either full time or deriving minimum of 50% of income from the farm. Have the authority to make and implement changes to the business. Open minded to new ideas, listen to others. Can contribute to discussion with their own experiences. Motivated, striving to develop their business and personal skills. Have stock weighing facilities on farm and already record key production data. Agree to share their production data and host a group visit (minimum once every 3 years). Is it only about Grazing? Where did you first hear about the group? 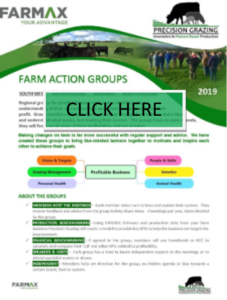 *Group members will agree to share and discuss their production data with Precision Grazing Ltd and the group members. All information will be confidential within the group and all members will be required to sign a confidentiality agreement. It is hoped that in Year 2 group confidence will grow to include financial data so farms can be able to benchmark on a cost of production basis. Where any farm business already has a FARMAX subscription and relevant Analysis farm model the annual cost will be £450.